Computer science is known as an extremely broad field. It covers a lot of aspects related to computers including the process of designing and programming them up to all the applications that are established and installed in them. It also refers to how computer science relates to other popular fields including arts, engineering and sciences. If you want to have an easier time learning computer science, then you should work hard towards fully comprehending its limits. You should familiarize yourself about the different computational techniques as well as their individual functions. This will make it easier for you to execute all your functions once you become part of the computer science industry. It should also be noted that becoming an expert in the computer science field requires you to undergo at least a basic computer science course so you will obtain a clearer idea about how this field works. Experts in the field also define computer science as the practical and scientific approach to computation as well as the applications that are linked to it. An expert in this field specializes in computational theories as well as the process of designing computational systems. It is also important for you to note that the subfields of computer science are categorized in various practical and theoretical disciplines including computational complexity theory and programming language theory. The computer science certification program offered by Brainmeasures is an impressive and highly commendable online certification program which can be expected to cater to the needs of all aspiring computer science experts. This computer science course gives you the chance to understand the scope of the field as well as all the aspects linked to it. Deciding to enrol in this certification course gives you the chance to undergo a well-developed computer science training which can help you in mastering every aspect related to computer science, the different theories and computational techniques that form part of it, the scope of the field and its functions, the different industries covered by it and the different subfields that continue to form the computer science field. Finishing up this certification course is very rewarding especially after you receive your computer science certificate which can showcase your strong background and commendable skill set in this popular field. 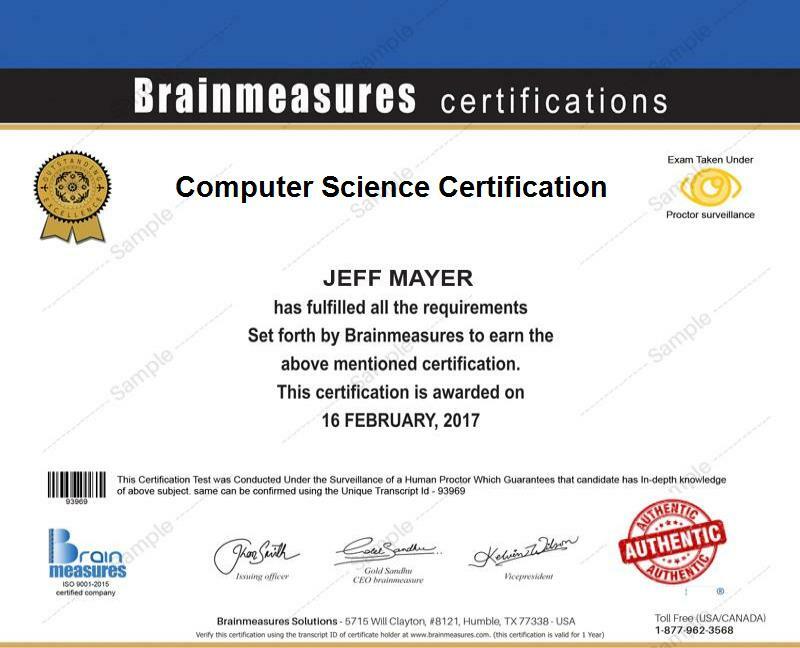 Anyone who has a strong desire to understand the computer science field and the entire information technology industry can take part in the computer science certification program available at Brainmeasures. It can help all aspiring computer science experts, IT professionals, engineers, IT technicians, programmers, developers and all other individuals and professionals whose job requires great understanding about computer science. Working in the IT industry after receiving your computer science certification also entitles you to receive an even bigger salary. You can use your certificate to work as a computer science consultant and earn an average of $85,000 annually. Working as a computer scientist is also beneficial because it gives you the chance to enjoy around $75,000 to $120,000 on an annual basis.